Last month, despite pressure from landowners, celebrities, 174,000 petition signers and a group of Native American youth who ran across the country in protest, the Army Corps of Engineers granted a construction permit for the Dakota Access Pipeline. But opponents are not backing down in their fight to stop the project and prevent any further commitment to an industry that fosters violence against indigenous women and threatens the health of marginalized women across the country. Máxima Acuña and her family had been living on their little plot of land in the Peruvian highlands for 17 years when the men from the mining company first came to her door. 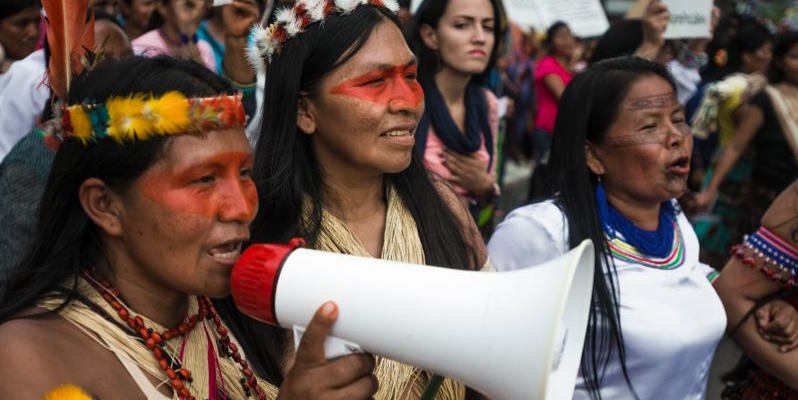 Last week over 500 indigenous women and their allies came together in Puyo, Ecuador to denounce a contract the government recently signed with Chinese oil corporation Andes Petroleum.